The day dawned bright and sunny and it was fairly warm although there was a tiny breeze we could feel when we were in the shade. The area is covered in trees so we were rarely exposed to full sunshine. Today Lewis, Gina and I had an exclusive excursion for just the three of us. 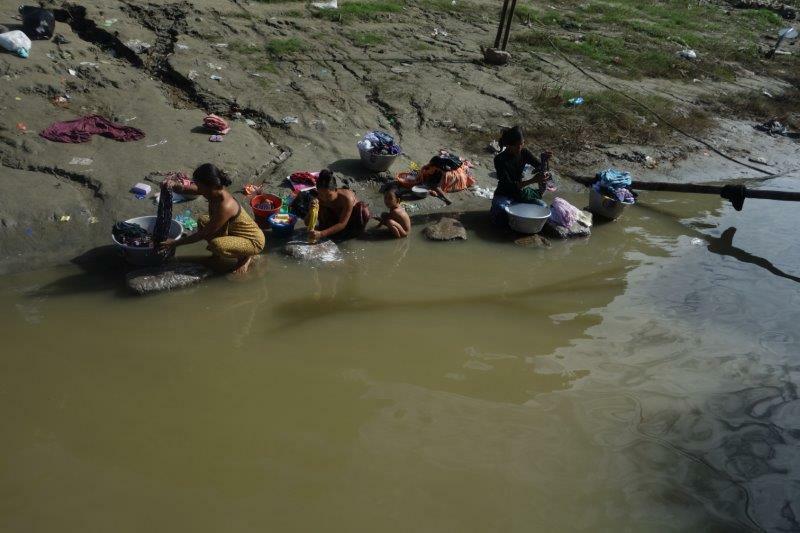 Many of the passengers were disembarking from the Road to Mandalay and many more would be arriving at lunch time. We also had a new guide, Pyae, pronounced Pi. She declared herself a novice as a guide but she was very well informed and it was a delight to travel in a SUV without a hint of a crowd! 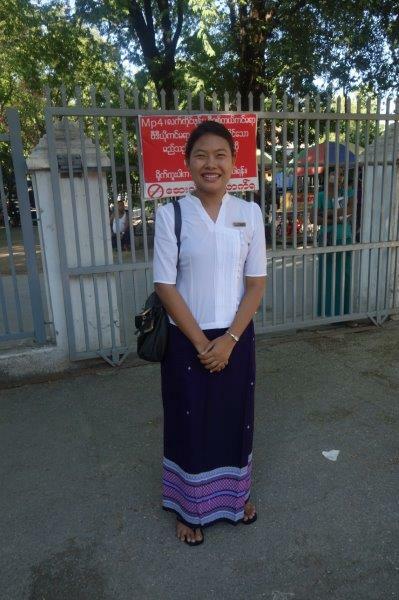 Pyae and our driver took us on a tour of Sagaing. 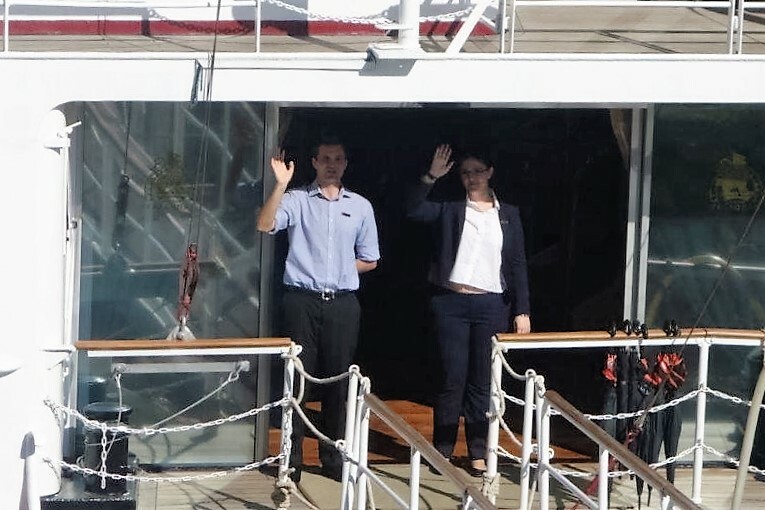 As usual we were waved goodbye from the ship by Celine (the manager from Paris) and Ben (the Assistant Manager from Hull). The Yadanabon Bridge spans the Ayeyarwady River in the Mandalay suburb that connected with Sagaing City. It is 610 m upstream of the Ava Bridge which is at the confluence of the Ayeyarwady with the Myitnge River, close to the Jyayujse rice fields. The bridge is the gateway to Yangon, Mandalay and other regions in the interior. The old Ava bridge across the Ayeyarwady River had a span of 1,203 m. Built by the British in 1934, it was the only bridge that spanned this river until the 1990s. The Ava had aged, and its carrying capacity became limited to under 15-ton trucks since 1992. Heavily laden vehicles crossed the river with Z-craft ferries, resulting in less efficient transportation of goods. The new Ayeyarwady Bridge was built by the Public Works of the Ministry of Construction. It now has total span of 1,711m long and has a four-lane motorway 15m wide with pedestrian lanes of 1.8m wide at each side. It is designed for a carrying capacity of 60 tons. Its approach on the Mandalay side is 350m while that on the Sagaing side is 240m. The new bridge was opened on 11 April 2008. A second bridge a little way downstream has also been constructed to carry trains only. We crossed the new Yatanabon Bridge into Sagaing! It has a wonderfully peaceful feeling. 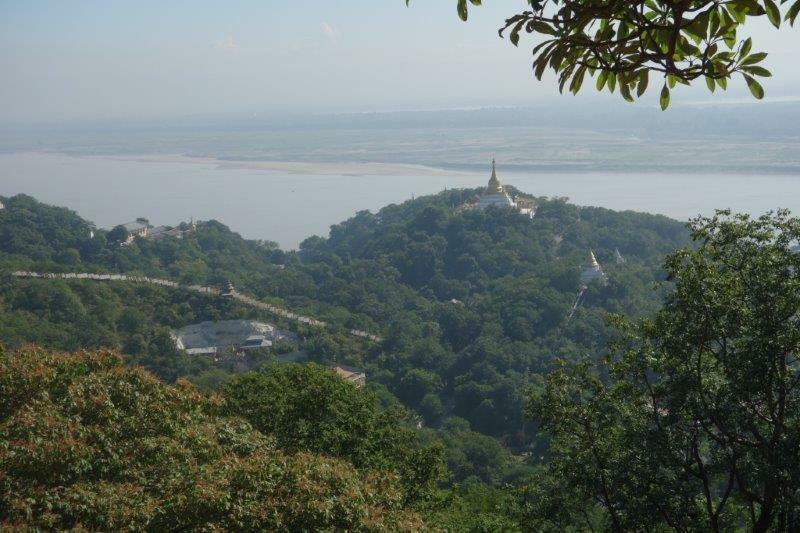 In the Sagaing hills, 20km to the southwest of the ancient capital of Mandalay and on the opposite bank of the river in Upper Myanmar there are hundreds of pagodas, stupas, numerous monasteries, nunneries and learning centres. This is a very special place – remote but also, from a spiritual point of view, a focal point of worship for Buddhism in the country. 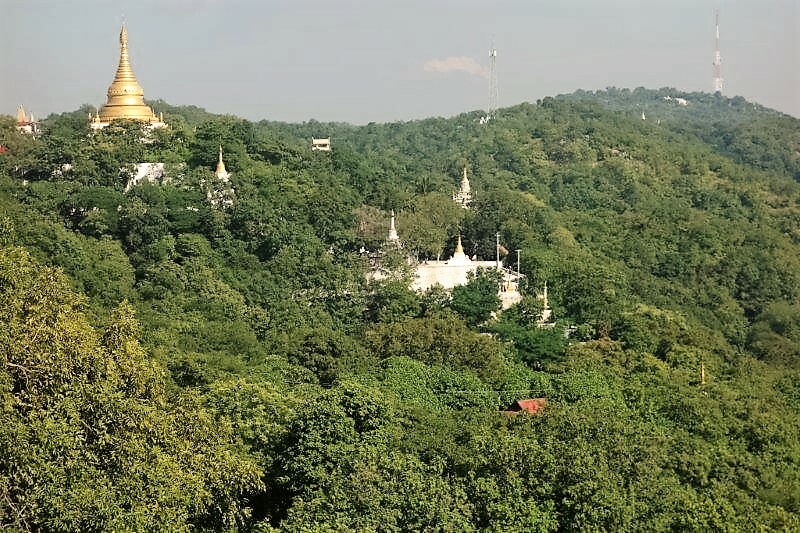 The very fact that it's remote has always attracted meditators, recluses and hermits, generating a kind of religious myth about the place that has attracted pilgrims from all over Burma. The high level of spirituality is expressed in the presence of thousands of nuns and monks in the area, living in groups in nunneries and monasteries - making the area the `abode of sage recluses'. 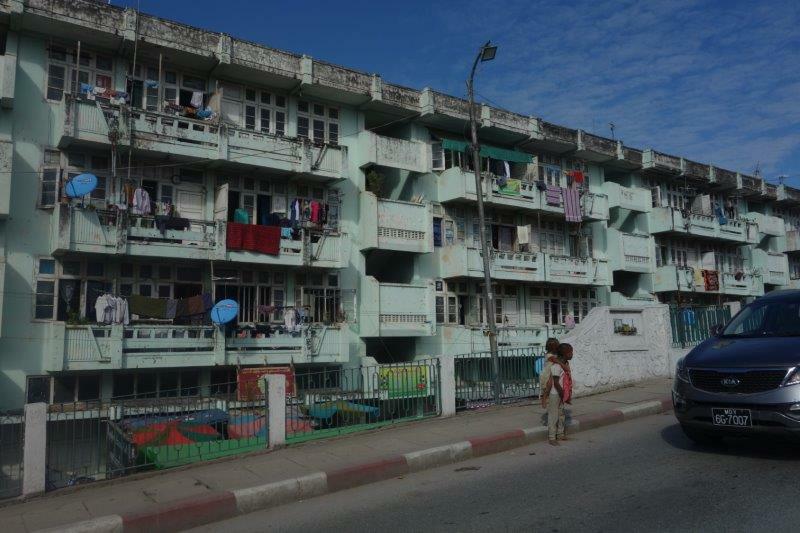 There are also lay people living in Sagaing - some scattered among the monasteries and nunneries, and most in the market town of Sagaing about half an hour's walk from the monastic community. The monks and nuns make ends meet in a very distinctive way - they are entirely dependent on lay people for their daily existence, living from hand to mouth on donations. Unlike Christian nuns and monks, Buddhist monastic communities are not supposed to involve themselves in any form of livelihood activity but must be kept by donors, who by giving donations, build up spiritual merit for their next life - and worldly success in this one. Nunneries and monasteries don't just consist of adults. Although all members are celibate, they live in groups like families, including small children as young as five. 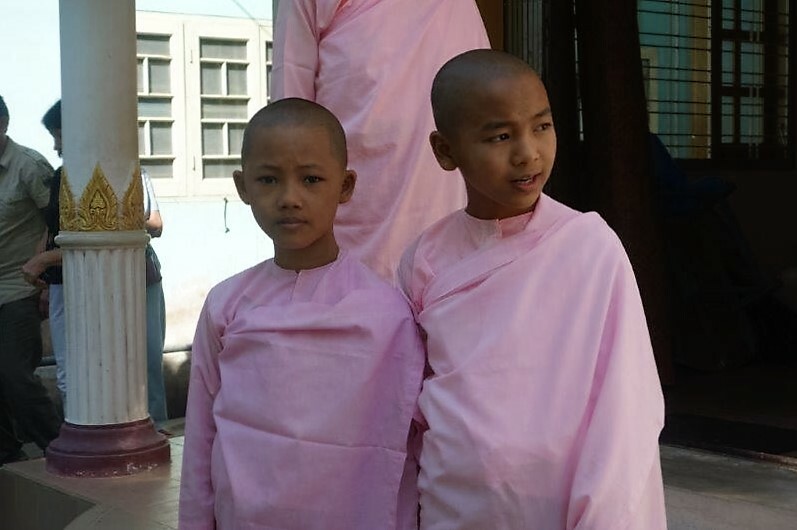 Some of these little children stay a week as temporary monks or nuns; others stay their whole lives. The days of the monks and nuns are taken up with prayer, study, household work, chanting and meditation. Monks wear dark red toga-like robes; nuns dress in pink robes as mentioned before. They possess very little of their own. Each group of monks or of nuns is tightly bound together, leading a highly disciplined but serene and happy life. Monasteries are not divided within themselves into smaller groups, but nunneries are usually split up into a number of separate households, called `pots' because they share all their food. When donations are made to the monasteries, they are always pooled. 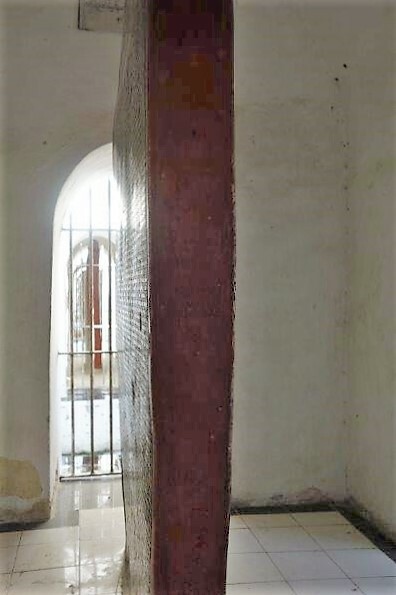 But a donation to a nun is made to the pot to which she belongs rather than to the nunnery as a whole, and only within that pot is it shared fully (though there is good deal of informal sharing with neighbouring pots, as happens in a normal village). 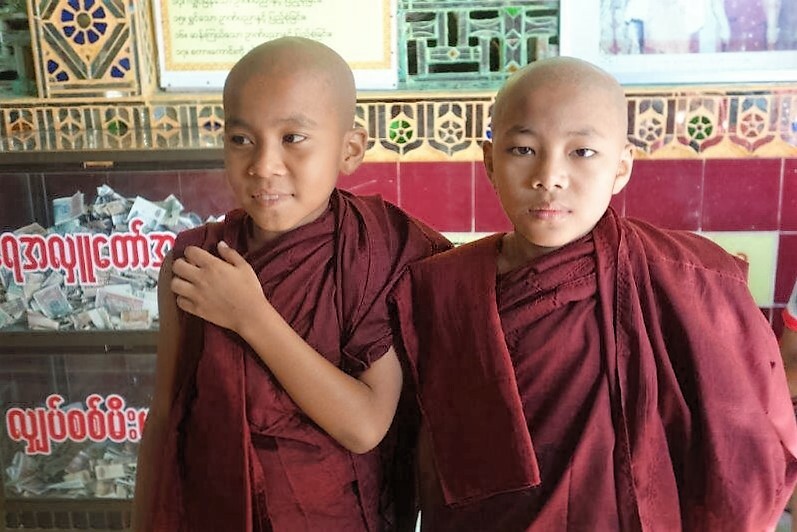 The networks of donors on which the nuns and monks of Sagaing depend show how important a strong set of social relations is to people's livelihoods - what is sometimes called social capital. The interdependence between nuns and monks on the one hand and lay people on the other seems to be one which benefits both sides, and expresses the trust and reciprocity which exists between them. The monastic communities may also be said to have something we might call `spiritual capital'. The monks and nuns are happy people. The fact that they are interlinked and dependent on their donors is something which gives them a sense of strength and of being needed, and this is almost certainly important in giving them a sense of peace and stability. But their spirituality is also important in establishing their own serenity. It also ensures that donors will keep giving to them. Donors benefit from the relationship with the monastic community in terms of their own state of mind. They get a sense of security and stability from donating, because they believe that they are building merit for the next life and material wellbeing in this - and also because donating to the monastic community builds up their social standing in the lay community in which they live. 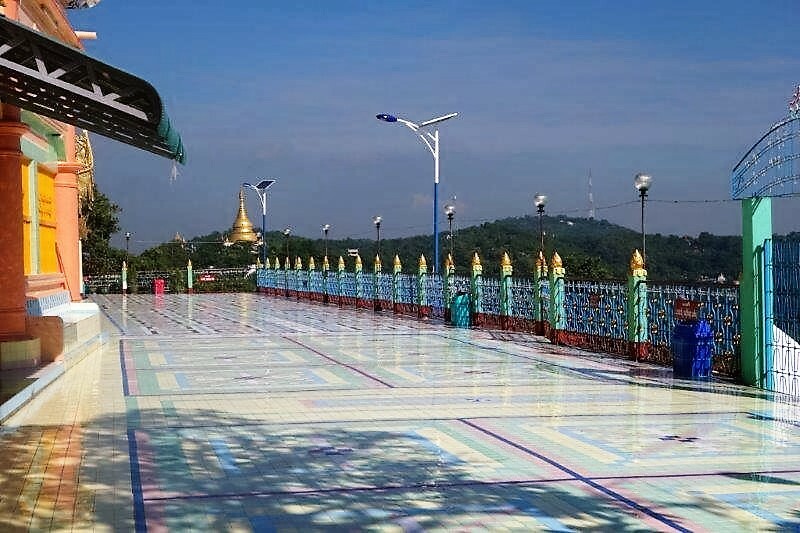 Sagaing was the capital of Sagaing Kingdom (1315–1364), one of the minor kingdoms that rose up after the fall of Pagan dynasty. During the Ava period (1364–1555), the city was the common fief of the crown prince or senior princes. The city briefly became the royal capital between 1760 and 1763 in the reign of King Naungdawgyi. On August 8, 1988, Sagaing was the site of demonstrations which were concluded by a massacre in which around 300 civilians were killed. Today, with about 70,000 inhabitants, the city is part of Mandalay’s built-up area with more than 1,022,000 inhabitants estimated in 2011. The city is a frequent tourist destination for day trippers like us. 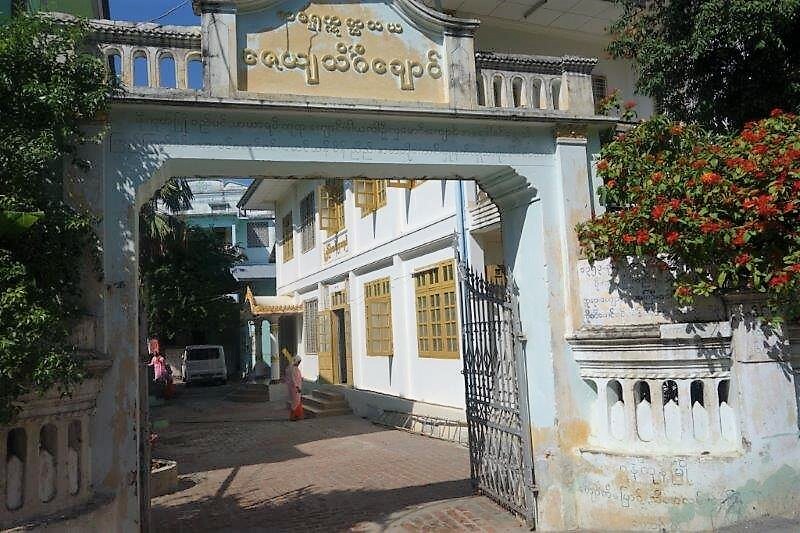 It is home to the Sagaing Institute of Education and the Sagaing Education College. The central pagoda is Soon U Ponya Shin Pagoda. It is connected by a set of covered staircases that run up the 240m hill. The covering is a very clever idea because the climb is significant and it means that people can walk up without fear of getting drenched in the rainy season. Inside there is the obligatory statue of a Buddha, on this occasion, surrounded by beautiful stonework on all sides. The ceiling was very ornate too where it almost seemed a shame that things like light bulbs and sprinklers detracted from the original design. Very young novice monks were all over the place, usually pretty close to the donation boxes which were everywhere. Children can join a monastery or a nunnery any time between the ages of 6 and 20 for as short a period as a day or forever. It is expected that everyone will join one or other at least twice during their life, but the length of time doesn’t appear to be relevant. Outside all the floors were marble with many different patterns and colours. 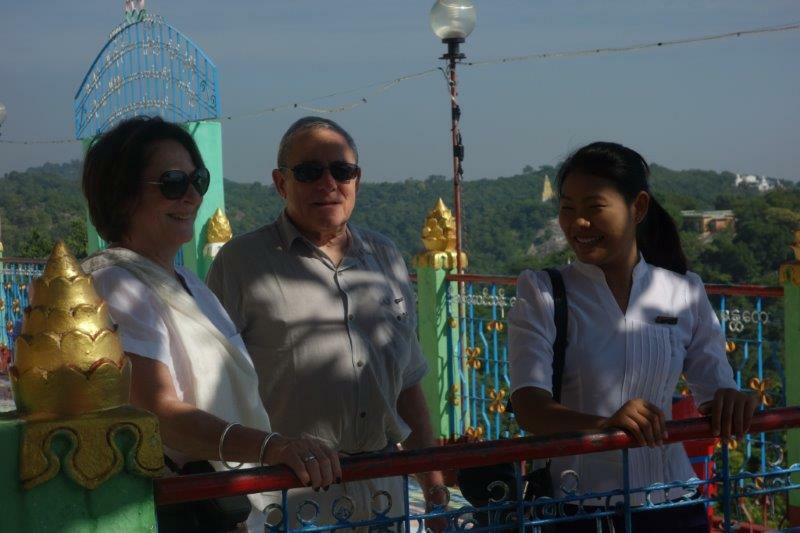 And Gina, Lewis and I enjoyed everything that Pyae had to tell us about the history of the area..
From here we could enjoy the expansive 360-degree views in all directions from the high vantage point. From Soon U Ponya Shin Pagoda we drove down the hill to the Zayar Theingi Nunnery. The entrance was rather unimposing but the nuns of varying ages inside were delightful, from these two very young girls to these two older nuns, one of which (on the right) told us that she had entered the nunnery at the age of 10 and that she was now 40. 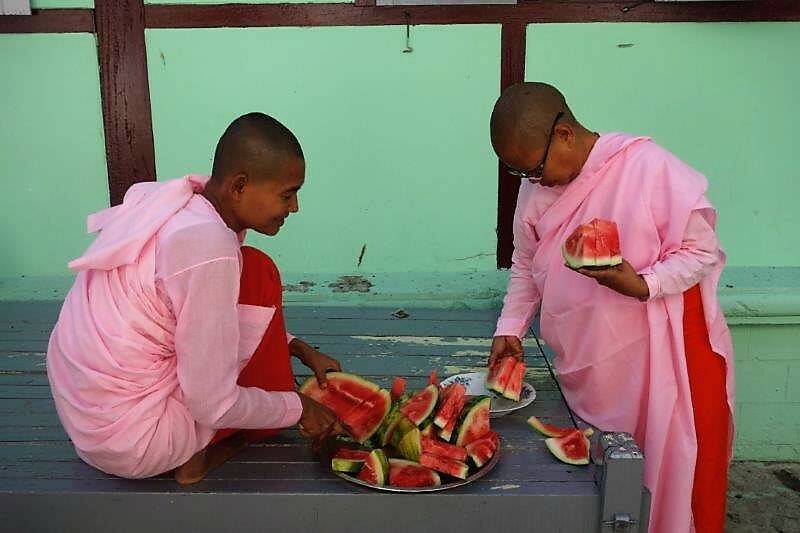 They were cutting up and dispensing water melon and both we, and the nuns, partook. 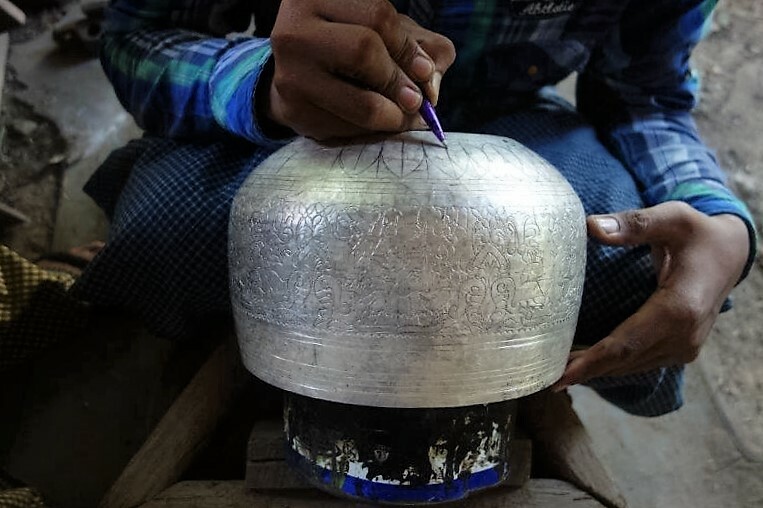 Sagaing is famous for the silverware its artisans produce and we visited a workshop where they work, so that we could watch them in operation. 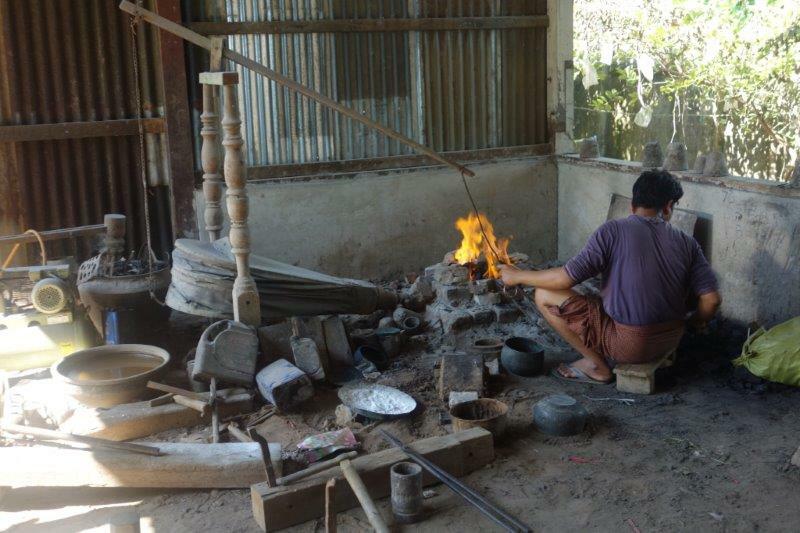 We found this workshop on the Sagaing-Monywa road in Ywa-Htaung village. They were making various kinds of silverware such as jewellery, bowls, trays, boxes and Buddha images. 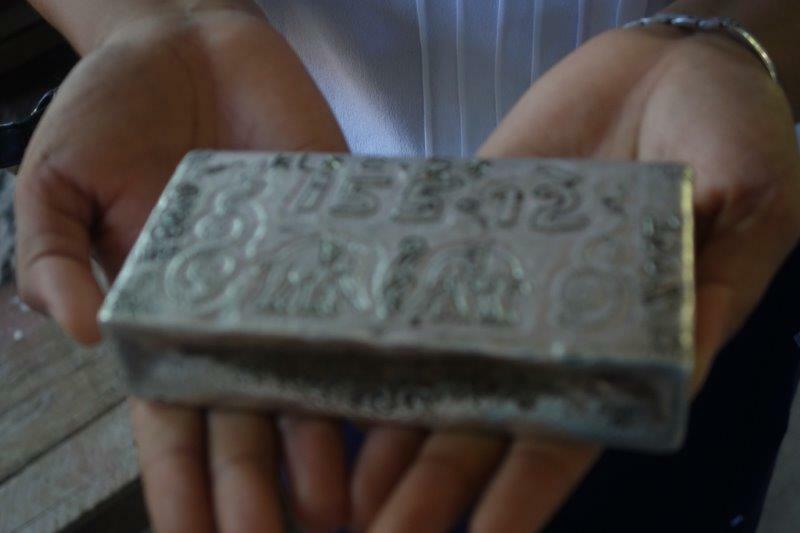 Pieces are cut off from an ingot made of silver like this one – which is remarkably heavy. Differently sized pieces can obviously be melted down to make differently sized ornaments. This poor chap spent the whole time we were there working the bellows to keep the fire hot – and the temperature that day was in the high 30s so it was an unenviable job. 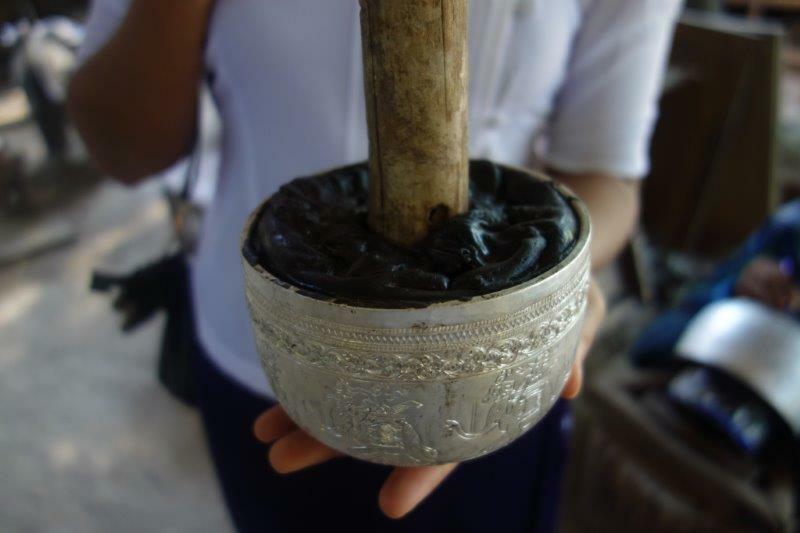 A substance (that includes wax) is poured into the inside of the bowl (in this case) and a piece of wood is fixed in the middle while it cools. And then artisans like this one can create designs before the article is finished. There was so much on offer and I couldn’t resist buying a minute tortoise – a symbol of peace in Myanmar – actually made of bronze and silver plated. As I bought him in Myanmar, I will be calling him by a Burmese name - Tun. He will be a friend for Thomas the tortoise who lives outside in my garden in Camborne. If you want to see him, you’ll have to come and visit! We’d been having a very busy day up to this point but we soon discovered that it was only just beginning. We went back to the boat for lunch and then set off again for Htin-Win – a short little boat ride across the river. 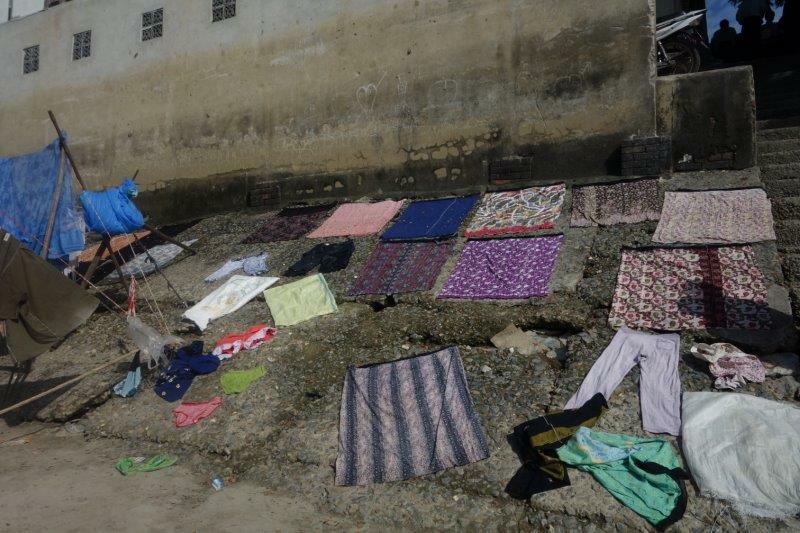 As we crossed over the ‘gangplank’ to the shore we came across some local women doing their washing in river water that looked none too clean. Having said that, the clothes that were laid out on the rocks above them looked as clean as they always do when they wear them so the colour of the water might perhaps have been an illusion - although I'm not quite sure how! As we drove along the road we passed a couple of sights that reminded us of how much work has to be done everywhere to raise the standard of living in the city and made some of our poorer areas in New Zealand look luxurious in comparison. These apartments, for example, had no land around to cultivate or develop. 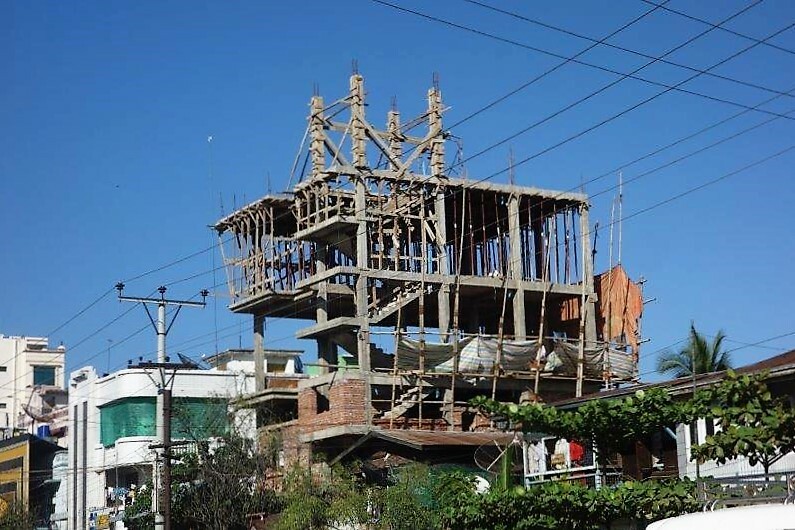 Building work is obviously going on, albeit slowly, but the scaffolding would never pass the OSH standards in New Zealand! We were bound for Shwenandaw Monastery, known as Golden Palace Monastery, located near Mandalay Hill. Shwenandaw Monastery was built in 1880 by King Thibaw Min who dismantled and relocated the apartment formerly occupied by his father, King Mindon Min just before Mindon Min's death, at a cost of 120,000 rupees. Thibaw removed the building in October 1878, believing it to be haunted by his father's spirit. The building was reconstructed as a monastery over the course of 5 years, dedicated in memory of his father, on a plot adjoining Atumashi Monastery. The building was originally part of the royal palace at Amarapura, before it was moved to Mandalay, where it formed the northern section of the Hmannan (Glass Palace) and part of the king's royal apartments. It was originally heavily gilted with gold and adorned with glass mosaic work although this is not evident today. 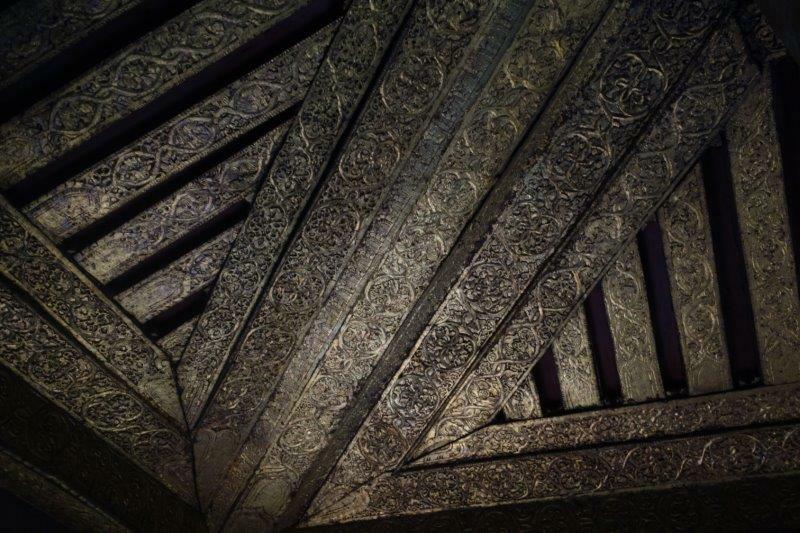 The monastery is known for its teak carvings of Buddhist myths, which adorn its walls and roofs. It is built in the traditional Burmese architectural style. Shwenandaw Monastery is the single remaining major original structure of the original Royal Palace today. We’d all noticed over our stay here that nearly every sign is in the language of the country, whether that’s Burmese, Pali or a local dialect. There were hardly any signs translated into English which gave an indication of how little tourism has encroached into this beautiful country. 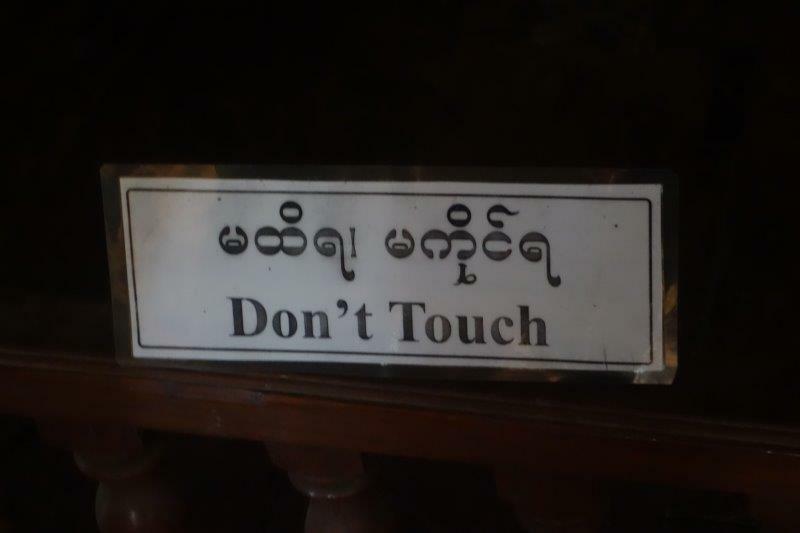 We were all fascinated, therefore, to see that a couple of the signs in the monastery were very clearly in English! 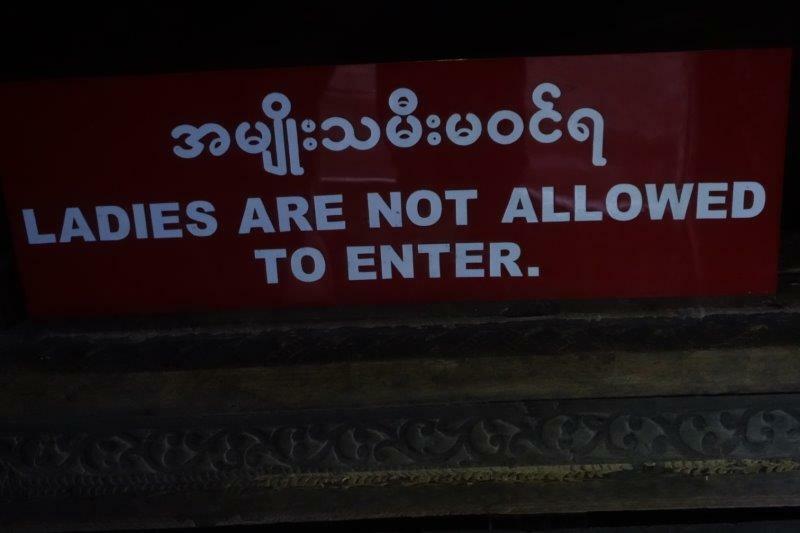 Soe had told us during his talk on Buddhism a few days earlier that this sign was quite common in the inner sanctum of Monasteries – and he thought it was inappropriate (what else could he possibly say to a mixed audience?) as there was nothing in Buddha’s teachings that gave rise to this directive. From here we went to Kuthodaw Pagoda which is a Buddhist stupa that contains the world’s largest book. 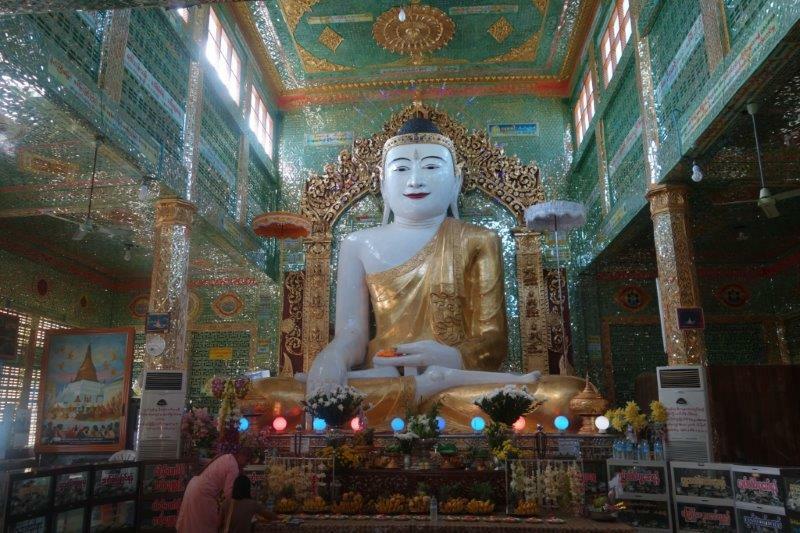 It lies at the foot of Mandalay Hill and was built during the reign of King Mindon. 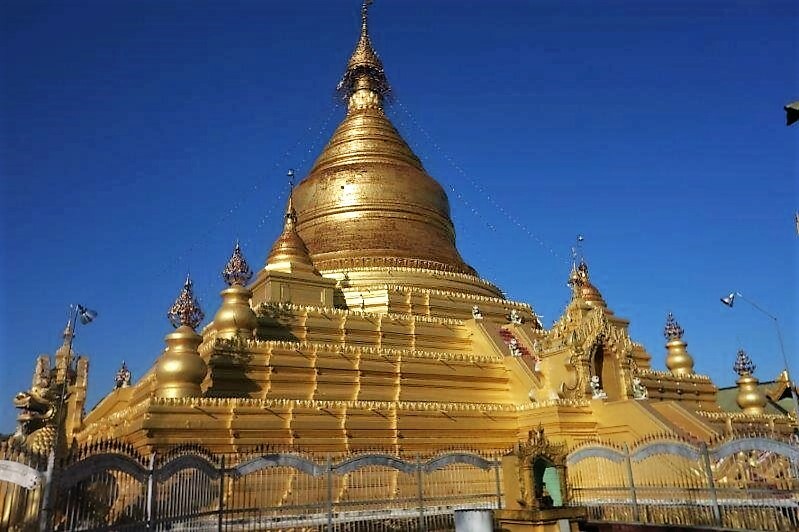 The stupa itself, which is gilded above its terraces, is 57m high and is modelled after the Shwezigon Pagoda at Nyaung-U near Bagan. This model of the stupa was in a glass case and gives an idea of the size and extent of the caves surrounding the main Pagoda. 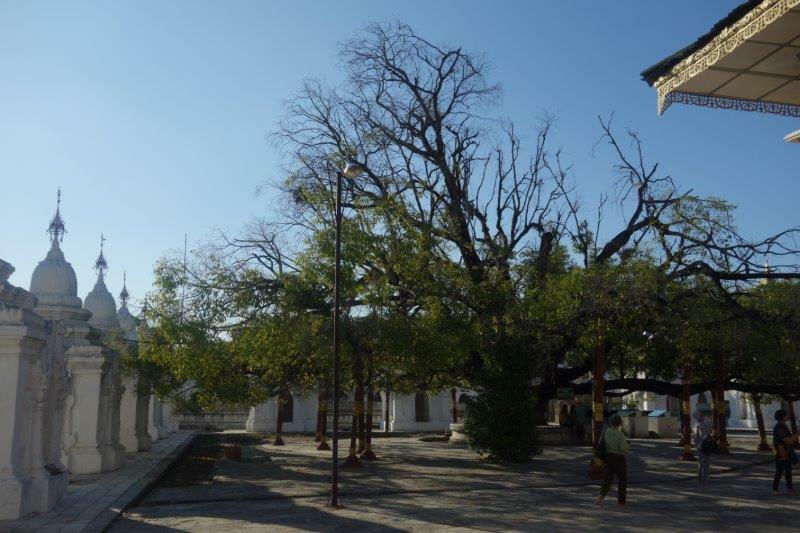 Mindon Min had the Pagoda built as part of the traditional foundations of the new royal city of Mandalay in 1857. He was later to convene the Fifth Buddhist Synod in 1871, but wanted to leave a great work of merit by having the Tipitaka, the collection of primary Pali language texts which form the doctrinal foundation of Theravada, set in stone for posterity, meant to last five millennia after the Buddha. Construction began in 1860. 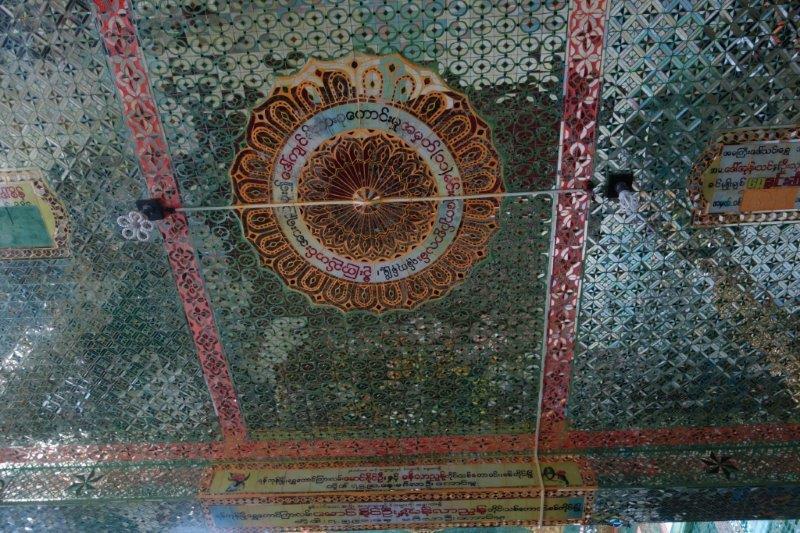 Its hti (umbrella) was mounted on 19 July 1862, and the inscriptions were laid open to the public on 4 May 1868. In the grounds of the Pagoda are 729 kyauksa gu. These stone-inscription caves each contain a marble slab inscribed on both sides with a page of text from the Tipitaka. If you look carefully, you can see that the stone-inscriptions stretch far into the distance and the writing is on both sides. Between the rows of stone-inscription stupas grow mature star flower trees (Mimusops elengi) that emanate a jasmine-like fragrance to the entire complex. One is purported to be over 123 years old. Burmese families may be seen having a picnic in the cool shade under these trees, picking the flowers to make star flower chains for the Buddha or to wear in their hair, or the children playing hide and seek among the rows of stupas. The history of the Paggoda has not always been happy, however. After the annexation of Mandalay by the British in 1885, the walled city with Mandalay Palace became Fort Dufferin, and troops were billeted all around Mandalay Hill in the monasteries, temples and pagodas. They became off-limits to the public and Burmese were no longer allowed to visit their religious sites. One revenue surveyor called U Aung Ban then came up with the idea of appealing directly to Queen Victoria since she had promised to respect all religions practised by her subjects. To their amazement and great joy the British Queen promptly ordered the withdrawal of all her troops from religious precincts in 1890. 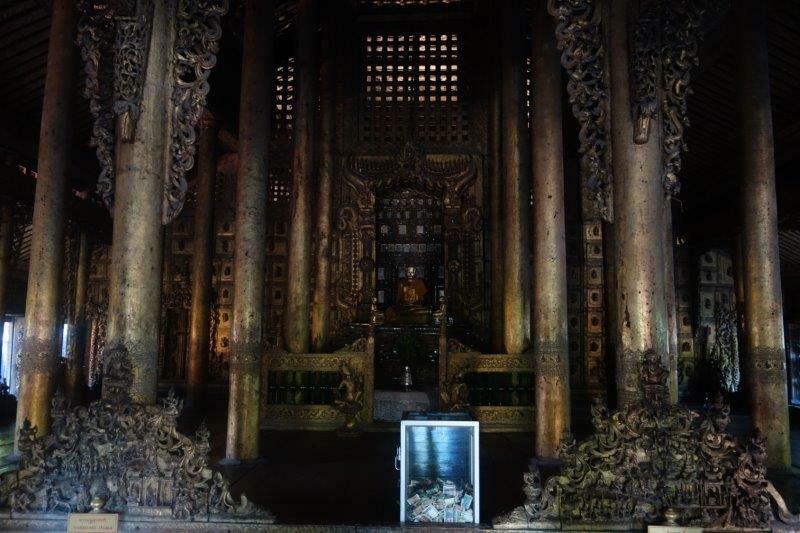 This however turned to great sadness when they found that the pagoda had been looted with the hti left lying on the ground stripped of its bells, gold, silver, diamonds, rubies and other precious stones, down to the Italian marble tiles from its terraces. The zayats lay in utter ruin and the bricks had been used to build a road for the troops. 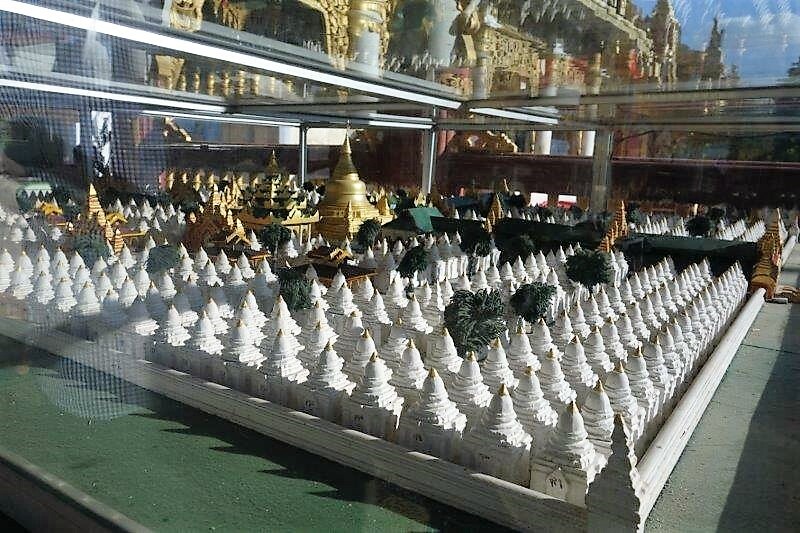 All the brass bells from all the kyauksa gu stupas were gone, 9 on each making it 6570 in total. The gold ink from the letters as well as the sides and top of each marble slab had also disappeared. All the biloos along the corridors had lost their heads, and the marble eyes and claws from the masonry chinthes gone. 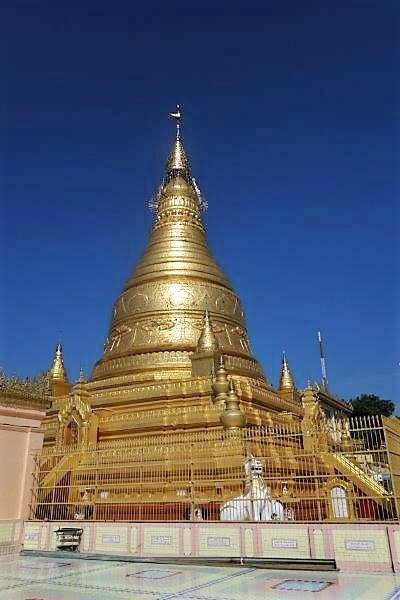 Fortunately members of the royal family, former officers of the royal army and donations from the public and wealthy merchants and traders resulted in the Pagoda being repaired and re-gilded. Leaving the Kuthodaw Pagoda, we made our way to a gold leaf beating factory. Preferring gold to silver, I expected to find myself tempted to buy but in fact we were somewhat dismayed by the physicality needed to beat the gold and in the event, I came away with nothing. These men beat the gold between two pieces of very fine wood for two hours at a stretch. They have a 30 minute rest and then continue for another two hours, completing an eight hour day. The photo is a little blurred because there was continuous movement. 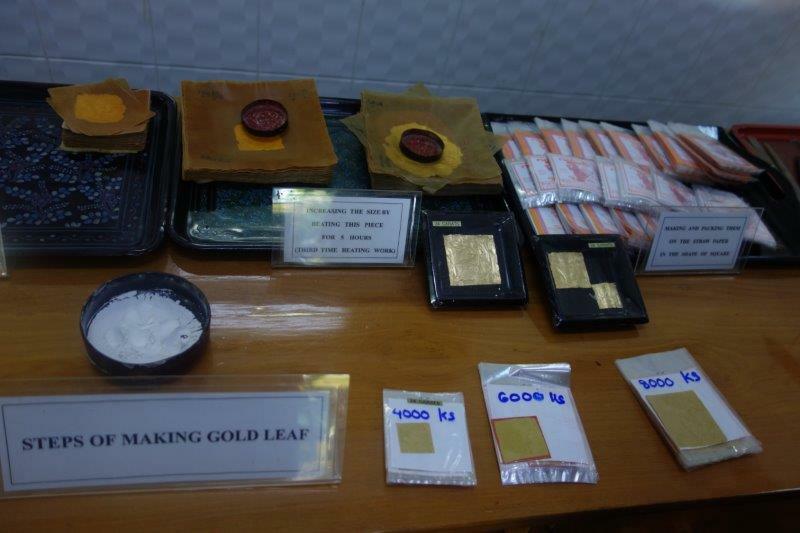 There are more processes of course but this room contained women and children delicately lifting the gold leaf with a small implement and putting each leaf into a plastic sleeve. Some were sitting on a cushion but most were sitting on the hard marble floor and they appeared to remain there for hours on end. The final product was displayed together with the steps taken to reach it. Of course, gold leaf is in high demand because the Buddhist people buy it to place on the various statues all over the country. Suh is the immensely strong belief of the people that they will buy large quantities of gold leaf to place on the religious statues of the Buddhas. And so we set off again, this time bound for U Bein Bridge, a crossing that spans the Taungthaman Lake near Amarapura. 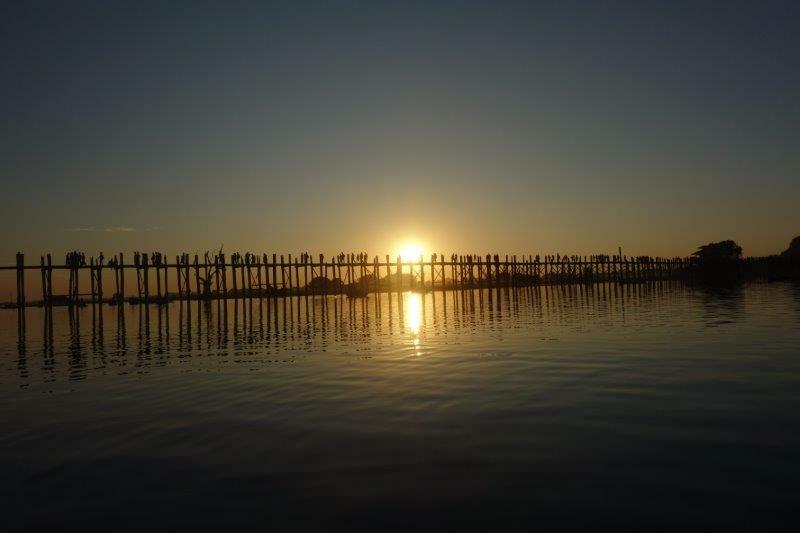 The 1.2 km bridge is believed to be the oldest and longest teakwood bridge in the world. We were to see it in the sunset. This experience will remain in my memory for a long time. It was very special and probably my favourite place for another visit. 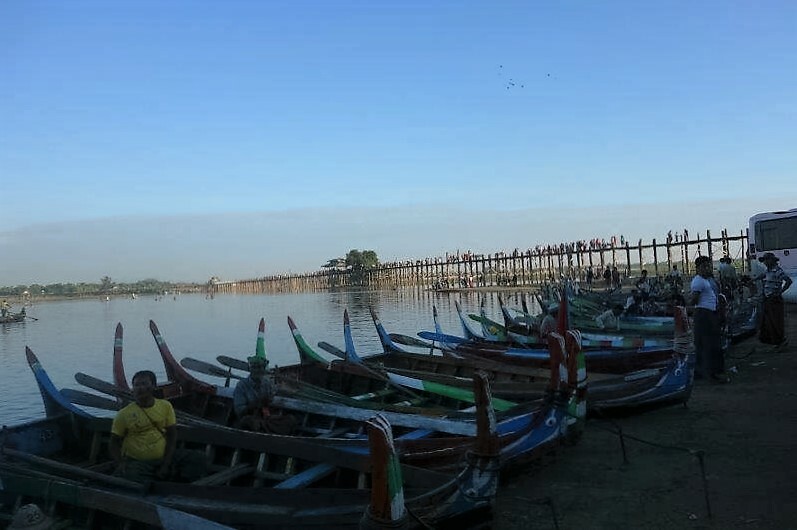 Construction of the bridge began when the capital of Ava Kingdom moved to Amarapura and the bridge is named after the mayor who had it built. 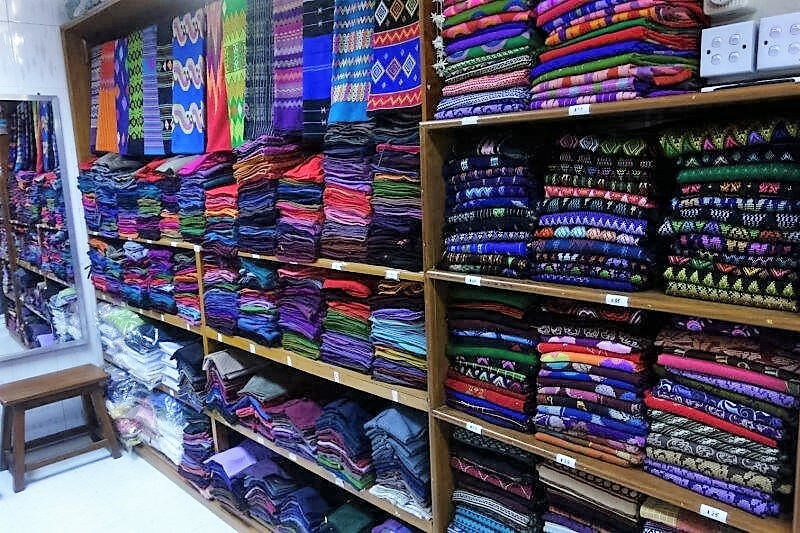 It is used as an important passageway for the local people and has also become a tourist attraction and therefore a significant source of income for souvenir sellers. It is particularly busy during July and August when the lake water is at its highest level. The bridge was built from wood reclaimed from the former royal palace in Inwa. It features 1,086 pillars that stretch out of the water, some of which have been replaced with concrete. Though the bridge largely remains intact, there are fears that an increasing number of the pillars are becoming dangerously decayed. Some have become entirely detached from their bases and only remain in place because of the lateral bars holding them together. Damage to these supports has been caused by flooding as well as a fish breeding program introduced into the lake which has caused the water to become stagnant. The Ministry of Culture’s Department of Archaeology, National Museum and Library, plans to carry out repairs when plans for the work are finalised. Eight police force personnel have been deployed to guard the bridge. Their presence is aimed at reducing anti-social behaviour and preventing criminal activities. The first arrest occurred in September 2013 when two men were reported for harassing tourists. The construction was started in 1849 and finished in 1851. Myanmar construction engineers used traditional methods of scaling and measuring to build the bridge. 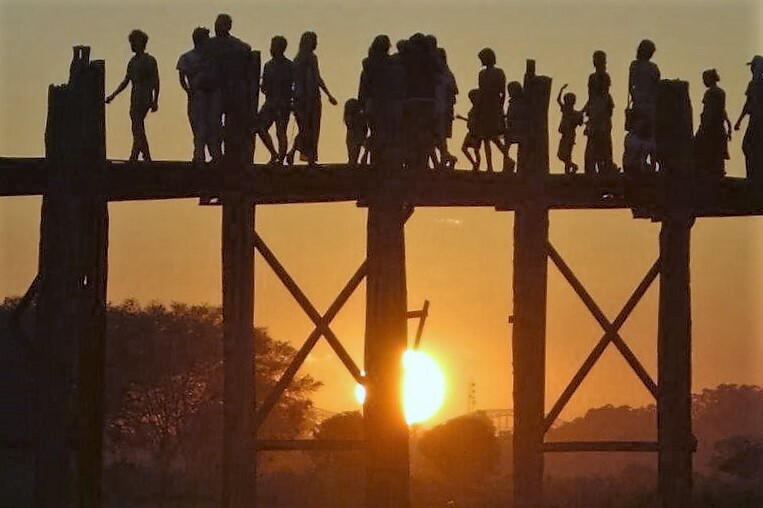 According to historical books about U Bein Bridge, Myanmar engineers made scale by counting the footsteps. The bridge was built in a curved shape in the middle to resist the assault of wind and water. The main teak posts were hammered into the lake bed seven feet deep. The other ends of the posts were shaped conically to make sure that rainwater fell past them easily. The joints were intertwined. Originally, there were 984 teak posts supporting the bridge and two approach brick bridges. Later the two approach brick bridges were replaced by wooden approach bridges. There are four wooden pavilions at the same intervals along the bridge. By adding posts of two approach bridges and four pavilions, the number of posts amounts to 1089. There are nine passageways in the bridge, where the floors can be lifted to let large boats and barges pass. There are 482 spans altogether and the total length of the bridge measures 3967 feet or three-quarters of a mile. Our SUV arrived at the landing area and people converged from all sides to board one of the very many small boats, manned by oarsmen, to set off into the lake before the sunset. Our oarsman was excellent and soon took us out into the middle of the lake. 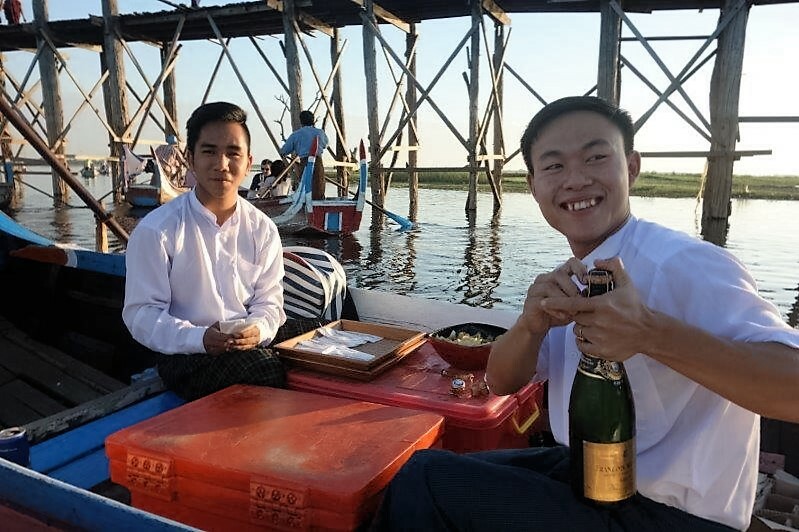 Imagine our surprise when another boat came towards us and we recognised Belmond staff complete with a chilly bin full of bottles of champagne! Is there anything more that they could possibly think of us to make our trip more pleasurable? Glasses poured for us, they moved on to other passengers from the Road to Mandalay and we sipped our champagne as we watched the sun sink below the bridge with the hundreds of spectators walking along its length. Of course, I took countless photos to catch the setting sun, thinking that each one would be my last chance, only to find that the sun sank really slowly and the next one was even better. This is just one of them. If we thought this was the end of our day, we had another think coming (as the ungrammatical saying goes)! 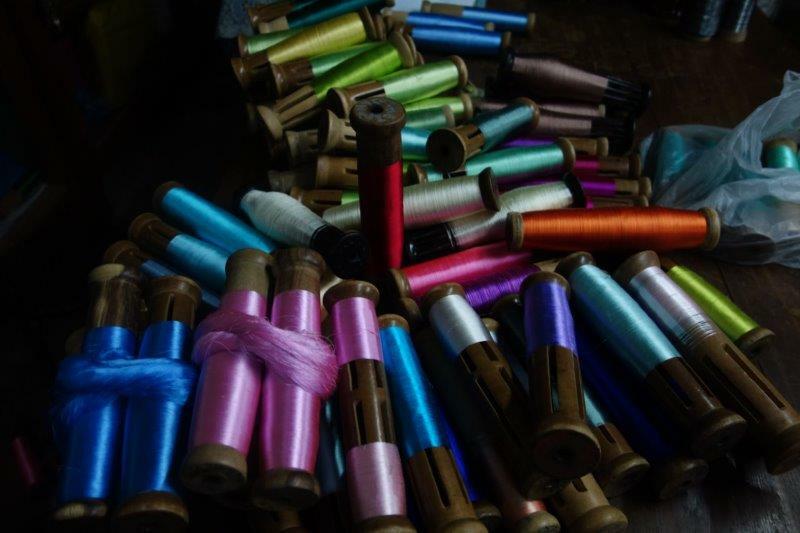 We were off to a silk weaving factory. 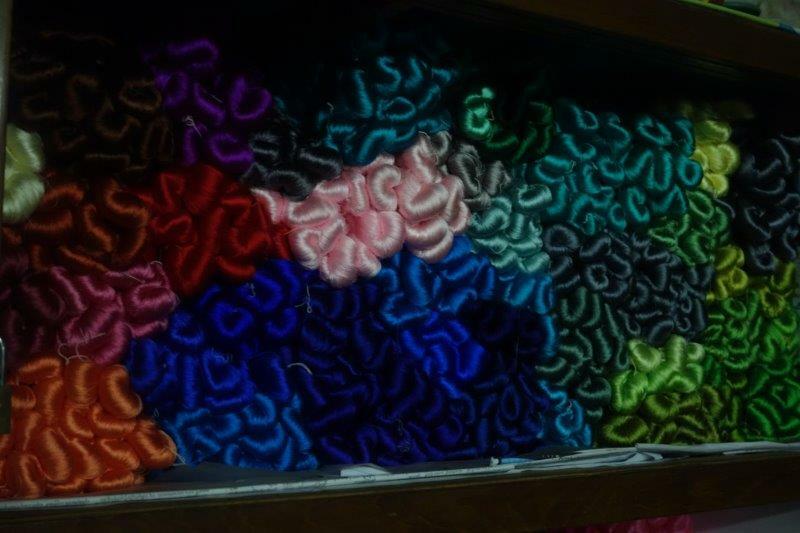 Silk is not made in Myanmar because the strong Buddhist influence will not allow the silkworms to be harmed so the raw material comes in from China or Thailand. And it comes in like this, in the most beautiful colours. 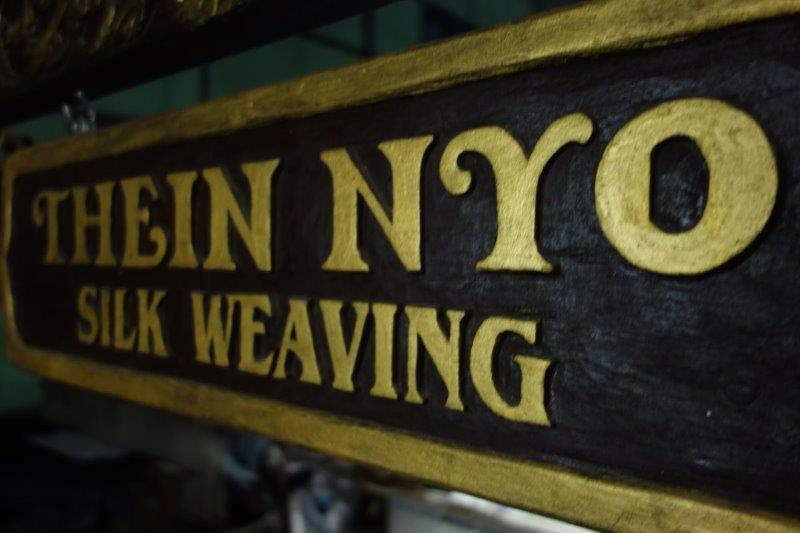 From here it is put onto spools, then small bobbins and finally the expert weavers begin the weaving process, sometimes using as many as 35 bobbins apiece. The finished products are displayed in the shop of course. If Gina and I hadn’t been so tired by this time we might have taken the time to buy up big. As it was, it was all just too hard for us to make choices and we came away empty handed. I don’t think the day could have been any fuller. Belmond is certainly making sure that we have a truly memorable experience. Original generation time 1.7967 seconds. Cache Loaded in: 0.0310 seconds.